Edison State’s thirty-fifth Police Officer Academy students were honored during a ceremony in December. Back Row (L to R): Cody Williams (Piqua), Charles Graves (Piqua), Coltin Stump (Greenville), Cody Ferguson (Sidney), Jordan Hamlin (Troy), Nicholas Kelch (Sidney), Brock Boyter (Greenville), Commander Joseph Mahan; Front Row (L-R): Richard Archer (Celina), Thomas Combs (Piqua), Anthony Hickman (Sidney), Justin Daniel (Covington), Austin Knight II (Sidney), Colin Lamprecht (Dayton). 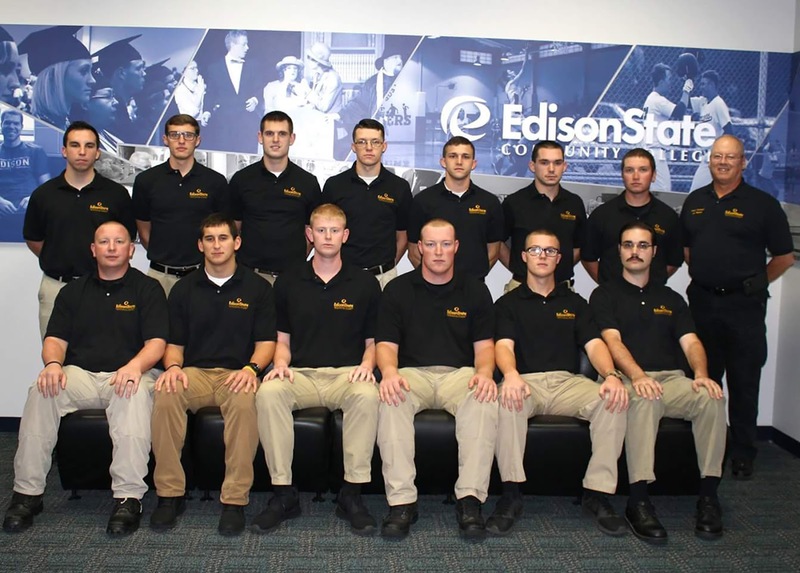 Edison State Community College’s Peace Officer Academy honored thirteen students in December following their successful completion of the 21-week program. Students of the program met for six days each week since January, totaling over 680 hours of training. The curriculum of the program is certified by the Ohio Peace Officer Training Commission (OPOTC) and covers all aspects of law enforcement training including administration, firearms, subject control, and investigation. “This was a great group of cadets. They all have the potential to become excellent police officers,” said Joseph Mahan, Basic Peace Officer Academy Commander. Edison State offered the first Basic Peace Officer Academy in 2003 and the class that completed academic requirements this spring was from the thirty-fifth academy. Throughout its fourteen-year history, the program has graduated 455 students. Many students have become officers throughout the region, though they are certified to seek an officer position anywhere in the State of Ohio. Academy students can continue their education at Edison State and earn an associate’s degree by taking classes on campus or online. Following successful completion of the police officer program, cadets are required to pass the state certification exam. For more information about joining the upcoming academy, contact Veronica French at vfrench@edisonohio.edu or 937-778-7865. Those interested in entering the academy must be 21 years of age and eligible to own a weapon.